You've seen all those beautiful winter photos taken from the summits of Adirondack peaks, but have you ever tried winter hiking? Here in the Adirondacks, hiking is a popular year-round activity, but winter hiking introduces some new challenges. From frigid temperatures to sudden snow storms, you have to expect the unexpected if you plan to go winter hiking. For all you beginners, we've put together a list of the most important winter hiking tips you should know before you go. Before you head for the mountains wearing whatever winter clothes you have in the house, take some time to prepare for your winter hiking trip. While it's important to plan ahead any time you go for a hike, there are a few precautions you should follow before going on a winter hike. 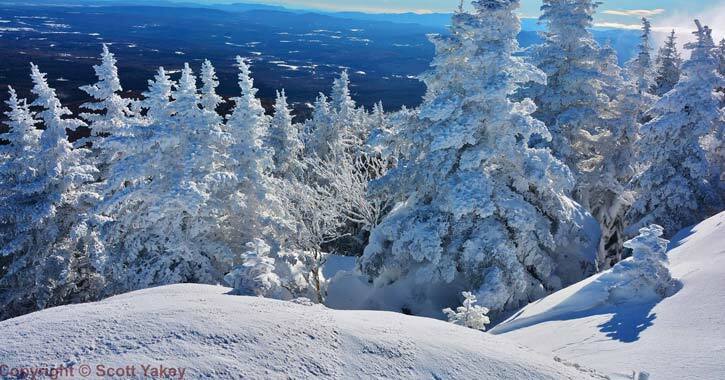 Winters can be harsh in the Adirondacks, especially near mountains. If you're planning on ascending a high summit, you must prepare for cold temperatures, deep snow, and strong winds. The best way to prepare for winter weather is to stay up-to-date on the latest forecast and trail conditions for the area you want to hike in. Take a look at the chance of precipitation, be aware of any new trail notices, check the temperatures, and keep an eye out for possible winter storms. You don't want to be hiking when a thick fog rolls in. In addition, if you can, you should check how much snow has already fallen in the area. This will help you determine if you need snowshoes or cross-country skis for your trip. One final tip to remember is that days are shorter in the winter season. Check when sunrise and sunset will be on the day you plan to hike, and then try to avoid hiking in the dark. This list will help get you thinking about the basics of what to wear and bring. To be fully prepared, you should pack a few days worth of food and water, extra clothing, and other supplies. It's best to be overprepared for a winter hike than underprepared. Go with a friend or friends. If someone in your group is an experienced winter hiker, then they'll have good advice to share to keep everyone safe. Make sure someone knows you've gone winter hiking. Cell phone service is extremely limited in the Adirondacks, so it's important to plan out where and when you plan to hike. If you know the snow will be deep, wear snowshoes or cross-country skis to make traveling easier, reduce the chance of injuries, and prevent post-holing (deep footprints in the snow). Bring or wear crampons or other traction devices on your snow boots so you don't slip on icy areas. Be wary of areas with ice and sites where avalanches have occurred in the past. The cold air might feel refreshing, but you must remember to eat and stay hydrated, warm, and dry. This will help you prevent getting hypothermia (a medical emergency when your body temperature is below normal). It takes a lot more energy to travel through snow, so you'll want to rest often. If your skin turns red and feels very cold, then you should find a way to get warm, even if it means ending your winter hiking trip. This is a sign of frostnip, the first stage of frostbite, which is an injury caused by freezing. It is common on fingers, toes, the nose, ears, cheeks, and chin.